The Pro-rated Form 2290 is due by Dec 31st for vehicles first used in Nov 2018. Hey there Truckers, the HVUT Form 2290 is now due by Dec 31st, 2018 for vehicles first used since Nov 2018. The federal law states that the Form 2290 must be filed on a vehicle by the last day of the month following the month of its first use. 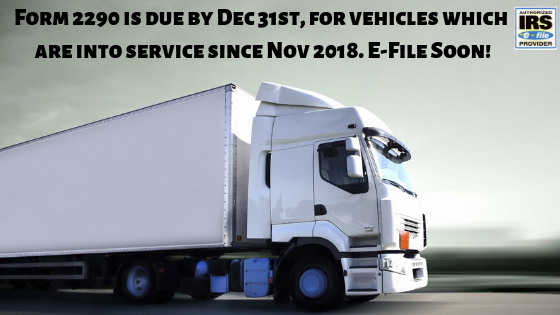 On that basis, the Form 2290 must be filed by Dec 31st, 2018 for any vehicle that is into service since November 2018. The Heavy Highway used tax Form 2290 is generally filed on any vehicle that comprises a minimum taxable gross weight of 55000 lbs or more and the same vehicle is been used over the public highway for commercial/Agricultural/Logging purposes. The Mileage limit for exemption is been set by the Internal Revenue Service for the above stated vehicles based on the nature of its purpose. For commercial & Logging vehicles, the mileage limit for exemption is pre-set to be 5000 miles and for Agricultural vehicles it’s 7500 miles. Any vehicle that surpasses the desired mileage limit for exemption based on the nature of its purpose, is classified to be a Taxable vehicle meaning that the vehicle is supposed to be reported on the Form and the taxes need to be paid full in advance (For regular annual renewals) and pro-rated /partial tax due payment is applicable ONLY for new vehicles. Although on the other hand any vehicle that is been used under the desired mileage limit for exemption is classified to be an Suspended/Exempt vehicle Meaning that these vehicles are required to be reported on a Form 2290 but there is no tax due that needs to be paid to the IRS. In general these type of vehicles are classified by category W.
Truckdues.com is rated to be one of the secured & simple websites powered by Thawte & McAfee which means our website can be relied upon this fact with no second thought. All the data is encrypted so there is never a chance for a breach to any information that passes through our website. This entry was posted in 2290 e-file, EIN, Form 2290, Truck Tax Online and tagged VEHICLE USE TAX DUE FOR 2018, WHAT IS 2290 EFILE?, what is 2290 tax?, WHAT IS A 2290 FORM, WHAT IS A 2290 FORM FROM THE IRS, WHAT IS A 2290 FORM IN TRUCKING, WHAT IS IRS FORM 2290 USED FOR, WHEN IS 2290 DUE?, when is form 2290 due?, WHERE TO EFILE 2290 TAX?, WHERE TO FILE 2290 ONLINE?, WHO IS REQUIRED TO EFILE 2290?, WHY E FILE 2290 TAX?, why efile 2290?, WHY TO FILE 2290 ONLINE? on December 11, 2018 by Truck Dues.